This is our newest refrigerated serve over counter with an additional refrigerated storage capacity with doors from the back of the counter. With an enlarged display area, Rhea S offers ample space for the display of merchandise, also a wide range of accessories. It provides stable temperature performance and optimal storage environment for meats, poultry, dairy and other products. 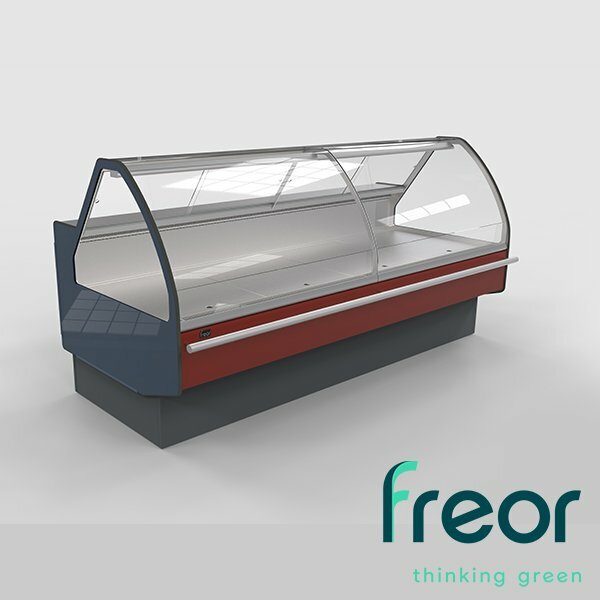 The harmonious and stylish design with smooth rounded glass underlines the attractiveness of products displayed and makes Rhea S an ideal solution for any store or food market. Wide display surface for optimal visibility. Even allocation of cool air throughout the whole area. Wide choice of colours for the exterior (RAL pallet). Polyurethane thermal insulation CFC free.